Wake Up to Live! 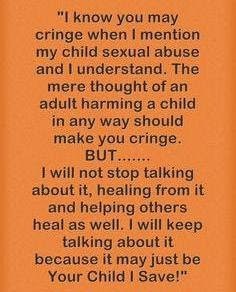 : Do You Cringe When I Mention Child Sexual Abuse? There is something real ugly going on; it's not the ugliness of childhood sexual abuse; although, that in itself is very very ugly; it's the silence society keeps regarding childhood sexual abuse. I can feel this hum of emptiness, a hush, when I or others talk about childhood sexual abuse. The concept of childhood sexual abuse is simple, I believe anyways. You and I, both, would do anything to protect our child(ren) from predators that prey upon our innocent children, yet when the adults of childhood sexual abuse begin to voice themselves, there is a sense of disbelief on the part of the listener. There is a sense of shaming they offer to the survivor, almost as though they are bestowing the cause of the sexual abuse to the child. Because the adults that have survived the ordeal of childhood sexual abuse are finally speaking out, they do not deserve your indifference. They deserve interest, empathy, and concern. They deserve to be listened to. I remember when I told my brother about the sexual abuse--the time when I finally spoke up about it "out loud." The entire family knew about the childhood sexual abuse, but nobody talked about it; it was prohibited! Nonetheless, my brother straight out said that he "didn't want to hear about it; he didn't want to hear about the gory details" and proceeded to shut me down and move onto a different topic. I don't know why I was so surprised, though; somehow I thought that over the years, and as we all got older and more 'mature,' we would be able to talk more openly about the topic of childhood sexual abuse, but I was wrong, obviously. I said to him, "Aren't you concerned about your sisters and why they have suffered so much?" He plainly wasn't interested. Sad but true; I still have a lump in my throat when I state this. Today, I see the challenge childhood sexual abuse survivors have in getting any recognition: recognition for the horror they endured; recognition for speaking the truth; and recognition for being able to survive the heinous crime and the consequences it tainted us with. At the same time, coming out--speaking up about the crime that was committed on you--can place us in a lonely and isolated corner with even family and friends abandoning, shaming, and blaspheming us. There are various theories about how and why change happens, but the essence behind change is a complete paradigm shift in the way we think and what we accept as normal. Many of us say that we do not accept childhood sexual (or other) abuse; yet, when confronted with a story, we turn our backs--our actions prove otherwise; so, once again, we continue to keep it in silence. Being passive about a cause doesn't make it go away; it only buries it deeper while the consequences surface like puss from a wound. As Martin Luther King, Jr. stated, "Every step toward the goal of justice requires sacrifice, suffering, and struggle; the tireless exertions and passionate concern of dedicated individuals," not by passivity, ignorance, and denial.